Juan Carreno de Miranda (Spanish Juan Carreño de Miranda; 1614-1685) was a Spanish painter of the Baroque era. Born in Aviles in Asturias, son of the artist with the same name. Trained in Madrid in the late 1620s as an apprentice to Pedro de Las Cuevas and Bartolome Roman. A nobleman by birth, he understood the internal structure and psychology of the Royal court. In 1669 Miranda was appointed court painter. In 1671, the main court painter. 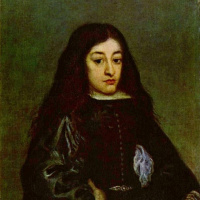 During the reign of Carlos II he played the same role in velázquez Philip IV. Miranda, Juan Carreno de (Juan Carreño de Miranda) (25.03.1614, Aviles – 10.1685, Madrid) – Spanish painter and graphic artist of the Baroque era. Born in the town of Aviles in Asturias, in a poor noble family. The artist's son with the same name. First studied painting in Valladolid. In 1623, his family moved to Madrid, where Juan was trained with Pedro de Las Cuevas and Bartolome Roman. There is speculation that he traveled to Italy, where he studied the work of famous painters, in particular Titian. In twenty years, he has already surpassed the teachers and left them to found his own workshop. In the earliest of his works clearly reveals the Italian and Flemish school in the first place – Rubens, van Dyck and Titian. To 1634 Miranda – already recognized as a painter, receiving a lot of orders, mostly at the writing altar images. Before entering the Royal service he worked primarily in the genre of religious painting. Religious works Miranda rich coloristic, finely modelled, like for example "SV. Sebastian" (1656), where the extraordinary expressiveness combined with soft and sensual Venetian style, as well as "Education of virgin Mary", written later but in similar Venetian manner. He likes to apply the effects of movement and perspective, as if to compensate for these powerful tools, taken over from the arsenals of the Baroque, a certain lack of inner confidence. The excitation and congestion of the late Spanish Baroque lead to some artificiality, artificiality. Though he chooses the best role models, focused on the highest achievements of European painting: the lessons of Rubens is evident in such films as "Mary Magdalene" and "Ascension". More simplicity, clarity, lightness and harmony in the painting "the Foundation of the Trinitarian order" (1666). Work on the decoration of the monastery of the virgin Mary of Aragon and the Church of El Rosario attracted to Miranda the attention of Velasquez, as a result Juan, who became his assistant, got in 1658 an order for the fresco of the so-called Mirror salon at the Royal Palace of Alcazar. There he met the painter Francisco Rizi, with whom later collaborated a lot – in particular, working on the decoration of the famous dome of the Church San Antonio de Los Portugeses and over "Magdalene in the desert" for the convent of Las Recogidas. The talent of the artist was appreciated at the highest levels, and in 1669 Philip II appointed Her court painter. The post the artist retained under the new king Carlos II. With 1671 Miranda, court painter to the Queen. In this period he wrote a lot of portraits, which first and foremost and famous. During the reign of Carlos II, the artist played the same role in velázquez Philip IV. It should be noted that at the time when the yard did not exist clever tradition of patronage, characteristic of some former rulers of Spain. Increased pressure on the art of dry formality, and religiosity. After the death of Velazquez in 1660, Zurbaran – in 1664 (the third largest master, Ribera, died early, eight years before Velazquez) a person of Spanish painting has changed. Her fertility, showmanship, and virtuosity is very high, but this is not to say about the depth of content. To protect and cultivate high artistic traditions in the period of stagnation – a special and difficult task. It is strange, that a master like carreño, was able so long to maintain a better quality of the Spanish school of painting, when its Golden age was already over. Working in the yard, he could study the paintings of Velasquez, who at that time almost entirely decorated halls, lobbies and stairs of the Palace in Madrid and the country residences of the king. Here – an incomparable collection of paintings by Venetian masters, headed by Titian and Veronese, and the painters of the Flemish, led by Rubens and van Dyck. And the strength and the weakness of the last generation of Spanish painters of the XVII century was the fact that their art was nourished by the heritage of the past, but found little support and encouragement in the historical and social life of the country. Beating the living life dies in Spain, it is preserved only in the paintings of earlier times – in Rubens and Titian, in deep concentrated portraits of Velasquez, to the ecstatic emotions of the works of El Greco, in the arrogance of the heroes of van Dyck. The paintings of Carreno describe him as loyal disciple and follower of the great masters of the past. And at the same time, he was a relentless witness to the spiritual emptiness of his contemporaries. Of Mirando repeatedly portrayed in Carlos II. These portraits are fixed with oil on canvas chronicle the transformation of a beautiful boy in a decrepit old man. But in the most shocking portrait images of Carlos shows a kind of aristocratic elegance, which is characteristic for the paintings of Carreno. The artist writes and the Queen mother, Mariana of Austria. He masterfully conveys the iridescence of precious silks and brocades, the glimmer of gold and jewels, shining armor – however, the latest offspring of the Habsburg dull, colorless, lifeless. Imitating velázquez, Juan carreño writes court jesters, and noblemen around the king ("Portrait of the Marquise of Santa Cruz", "Portrait of the Countess of Monterey", "Portrait of the Duke of Pastrana"). In these works the severe restraint velázquez is often combined with more elegant and worldly manner of van Dyck. Persons are always discharged with the utmost care. The paintings, depicting Carlos II, carreño writes with less liberty, referring to the traditions laid down by Antonis Mor. The Spanish Royal court were impressed by the arrival of a large Russian Embassy, and Miranda was ordered a formal portrait of Ambassador Peter Ivanovich Potemkin. Some critics believe that this is the best work of the master. Besides paintings Miranda sang and engravings. The artist led a quiet and peaceful life, was distinguished noble manners, gentle disposition and generous heart that drew to him the hearts of others. Tell you what, when he was invited to become a knight of the order of St. Jacob, Miranda refused to respond: "Painting needs no honors, she is able to give them the world." Miranda died in Madrid, lamented the favored people and numerous students, including MATEO Cerezo, Cabellero, Jose Jimenez Donoso, jerónimo Antonio Escarre. Carreño worked during the decline of Spanish art. Something in his painting the artist transforms into a kind of chronicler of a bygone era. To its great merit is the ability to capture and imprint a painful situation that gives us an idea of the reign of Carlos II. His best creations as would Herald the end of not only the reign of this king, but of the whole dynasty and the coming painful transition of the monarchy to the Bourbon. Carreño is often rightly called "the Spanish van Dyck," but it is van Dyck smaller scale, more dull and muffled.